Can Sundots, a supplement with fern extract, protect your skin from cancer? Dr. Emilia Javorsky and Chris Tolles are seeking crowdfunding support for their product. They look like Dots, the cone-shaped gumdrops in multiple colors that for generations have stuck to people’s teeth. But these drops come in only one color, amber, and pack an extract that its champions say does something no ordinary candy ingredient can do: protect skin from the sun. 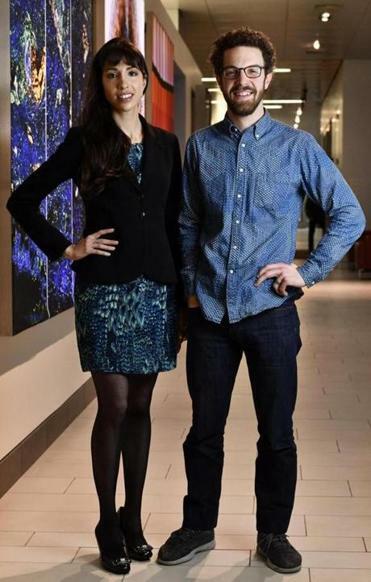 Two young Massachusetts entrepreneurs — one of them a physician and former postdoctorate researcher at Massachusetts General Hospital — are launching a crowdfunding campaign Monday for a nutritional supplement called Sundots. Each drop contains 240 milligrams of polypodium leucotomos extract, the active ingredient in a fern grown in Central and South America. Multiple peer-reviewed studies in humans and mice have shown that when the extract is ingested, it acts as an antioxidantand provides protection from ultraviolet radiation, which causes skin cancer and premature aging. Dr. Emilia Javorsky, chief scientific officer of Sundots, and Chris Tolles, chief executive, say their new product offers a tasty and easy way to get added protection from the sun. Too many people, they say, ignore dermatologists’ recommendations to apply a dollop of sunscreen and wear sun-protective clothing every day, even if they’re not going to the beach. “Sometimes simple solutions are the ones that end up being the most effective,” said Javorsky, who first read about the extract while doing dermatology research at Mass. General about seven years ago and later began ordering capsules of the herb online from a Spanish company for herself. “To me, it was a no-brainer,” she said. The founders of Sundots are starting a fund-raising campaign on Indiegogo, a crowdfunding website. Their goal is to generate at least $20,000 in online orders, which would enable them to manufacture and supply 400,000 drops to customers, starting this summer. They have a deal to buy the extract from a supplier in Ecuador, whom they picked after they got researchers at Worcester Polytechnic Institute to analyze samples from four fern growers. Javorsky and Tolles are paying a South Carolina gummy maker to mix the extract into the drops, which, like other nutritional supplements, do not need Food and Drug Administration approval. Dr. Craig Elmets, a dermatology professor and director of the Comprehensive Cancer Center Chemoprevention Program at the University of Alabama, said it’s not a wacky idea. Elmets coauthored an article last year on the extract in the Journal of the American Academy of Dermatology. He said the article concluded that polypodium leucotomos did little to prevent sunburn in people who participated in a clinical study. But Elmets told the Globe that it did have a “pretty profound effect” in inhibiting proteins linked to the development of skin cancer. Assuming the extract comes from a reliable source, he said, it’s a worthy complement to sunscreen — and he likes the idea of putting it in a gum drop. “That’s very clever,” he said. The extract has long been used as a folk medicine for skin disorders, including psoriasis and vitiligo. It appears to have been introduced to Europe in the 18th century as a result of a Spanish botanical expedition to South America. A month’s supply of Sundots costs $35 and contains 36 drops. You’re supposed to take one drop a day year-round, two on days when you spend a lot of time in the sun. They have a tropical fruit flavor. The Sundots founders, who work as consultants to life science and tech companies, say they believe in the drops so much that each has put up $12,000 of personal savings. Tolles, 32, said they are taking pains to market Sundots as an addition to, not a substitute for, sunscreen, in contrast to claims made for other nutritional supplements.